Evening check-in at Orlando airport for Aer Lingus flight to Dublin. Afternoon arrival at Dublin airport. Meet coach and guide for a morning panoramic sightseeing tour of Dublin including O�Connell Street, Trinity College, Government Buildings, Georgian Squares, Dublin Castle, Christchurch & St Patrick�s Cathedral, Guinness� Brewery, Kilmainham Jail, and the Phoenix Park. Mass at the Oblate Lourdes Grotto. Check into hotel, for 3 nights with dinner & breakfast. Take the afternoon to rest or explore the surroundings. Morning Mass at the Pro-Cathedral followed by visit to the shrine of St Valentine. We will continue our tour of Dublin with a visit to the famous Kilmainham Jail and of course the Guinness Brewery. There will also be an opportunity to walk the grounds of Trinity College and see the Book of Kells. In the evening we will see a theater production in one of Dublin�s fine venues. (optional - not included in the price). After a traditional Irish breakfast, we depart Dublin for the Wicklow mountains and will visit Glendalough, the 6th century monastic city of St. Kevin the place where Christianity survived the dark ages. The afternoon is free to walk the city and experience the local cuisine in one of Dublin�s fine restaurants or local pubs. Dinner & overnight in the hotel. Morning drive to Knock � Ireland�s major Marian Shrine, where the Blessed Virgin appeared in 1879. Afternoon Mass in the Apparition Chapel followed by a tour of the Shrine. Check into Hotel for 1 night, dinner & breakfast. Drive to the 13th century Augustinian Abbey of Ballintubber for Mass and tour of the Abbey. Continue to Ireland�s most popular pilgrimage mountain � Croagh Patrick where St. Patrick spent the 40 days of Lent. Afternoon drive to Attymass and visit the home of Fr. Patrick Peyton � the Rosary priest. Continue to hotel in Bundoran for dinner & breakfast. Morning drive to Lough Derg and see St. Patrick�s Purgatory from a boat trip round the island. 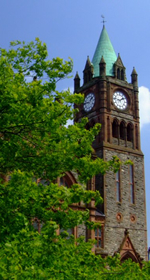 Continue to Armagh � the Ecclesiastical capital of Ireland � for Mass in the Cathedral of St. Patrick. Drive to Downpatrick, where we see the grave of our National Saint. �In Down, one grave three Saints do fill, � Patrick, Bridget, and Colmcille�. Overnight, dinner & breakfast in Belfast. Mass in St. Patrick�s Church and venerate a Relic of St. Patrick. Short sea crossing from Belfast to Cairnryan in Scotland. Drive to Oban and check into hotel for 2 nights, dinner & breakfast. 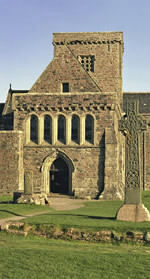 Day trip by boat to the Island of Iona � centre of Irish monasticism for 4 centuries. Here, a monastery was founded by St Columba (or Colmcille) in AD 563. Return to Oban for dinner & overnight. Morning drive to Edinburgh. Afternoon Mass in the Cathedral, followed by city sightseeing tour including : Edinburgh Castle, Hollyrood Palace, Princes Street, St Giles Cathedral, City Chambers, and Arthurs Seat. Check into hotel, breakfast. Evening Scottish banquet with music & entertainment. Transfer to Edinburgh airport for morning flight to London Stansted. London panoramic city sightseeing tour including: Buckingham Palace, St. Paul�s Cathedral, Westminster Cathedral � where we celebrate Mass, Downing Street, Houses of Parliament, Tower of London, Marble Arch, Kensington Palace, Nelsons Column, Covent Garden, Museums and Parks. Some free time in London. Check into hotel for 2 nights, dinner & breakfast. 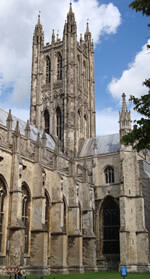 Day trip to Walsingham � national shrine of Our Lady. See the Old Abbey Grounds, the Anglican shrine, and the Friary ruins. At the Catholic shrine, celebrate Mass in the Slipper Chapel and see the Chapel of Reconciliation, Cloister, and Way of the Cross. Return to London. Morning transfer to London airport, for transatlantic flight to Orlando via Dublin due to arrive in the evening. Please note this itinerary is subject to change and should not be considered.